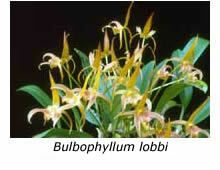 Many bulbophyllum species have rather small, short-lived flowers. 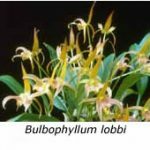 An exception is Bulbophyllum lobbii, which has relatively large flowers that measure 8-10 cm across and last up to a month in good condition. The yellow flowers, borne singly, have a hinged labellum that nods up and down in the slightest breeze, a feature designed to catch the attention of passing pollinators. The first flowers on my plants open early in January, but a few late flowers still remain as I write in late March. My plants grow and flower quite satisfactorily in a glasshouse at a minimum temperature of 11 °C but would probably do better if provided with a little more warmth in winter. Bulbophyllum lobbii is found over quite a wide area through Asia, its habitat ranging from Malaysia, through Indonesia and Borneo to the Philippines. Thomas Lobb, an employee of the famous British nursery of Veitch and Sons, first collected the species in Malaya and Borneo. John Lindley named the species after Thomas Lobb in 1847. 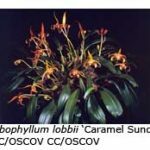 The Lobb brothers, William and Thomas, were born in Cornwall and began their horticultural training in the Cornish estate of Sir Charles Lemon, whose name is perpetuated by the well-known species Coelogyne cristata var. lemoniana. In the 1830s both William and Thomas sought employment in Veitch’s nursery, which by then had established a branch in Exeter. It was destined to become (for a time) the largest nursery in Britain (and the rest of the world). In the 1840s Veitch sent Thomas Lobb to collect tropical and sub-tropical plants, particularly orchids and tropical pitcher plants (Nepenthes spp. ), in various Asian countries. A succession of trips took him to Singapore, Malaya, Burma, Java, the Philippines and India. Some of the other orchids (apart from Bulbophyllum lobbii) that Thomas Lobb introduced into cultivation include Dendrobium infundibulum, Vanda coerulea, Aerides fieldingii (syn. A. rosea) and Paphiopedilum villosum. The loss of a leg resulted in his premature retirement in 1860. 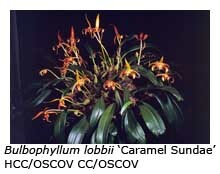 His name is perpetuated by the widely grown Bulbophyllum lobbii and also by Spathoglottis lobbii and Rhododendron lobbii. Thomas Lobb’s brother William, one of a long line of collectors sent abroad by Veitch’s nursery over the next sixty years, was sent to South America to collect cold-tolerant plants. His first major introduction to European horticulture was Araucaria araucana, the Monkey Puzzle tree. Sales of its seeds and seedlings alone were sufficient to pay Veitch’s expenses for the expedition, thus persuading him to send more collectors abroad. William Lobb introduced many other plants on this and subsequent trips but few were orchids. His greatest claim to fame was probably the discovery, in the Sierra Nevada of California, of the Calveras Grove, a group of 80 or 90 giant sequoia trees (Sequoiadendron giganteum) measuring 250-320 ft tall and 10-20 ft in diameter. One hundred and fifty years later, Calveras Grove is still a major tourist attraction and giant sequoia trees can now be found growing in temperate countries all around the world. None are yet as large as those growing wild in California, although there are some magnificent old specimens to be found in the botanic gardens at Christchurch and Dunedin in the South Island of New Zealand. The information about the Lobb brothers was gleaned from a book entitled The Plant Hunters: Two Hundred Years of Adventure and Discovery around the World, written by Musgrave, Gardner and Musgrave (1999).